Air101: What's on your British Airways 747 to New York? 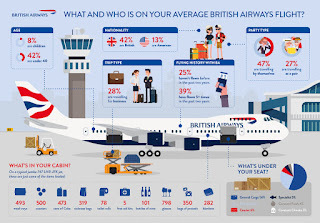 What's on your British Airways 747 to New York? The UK contingent of IAG has just released some, supposedly revealing, data of what it carries on one of the airlines medium haul flights. A Boeing 747 operating from BA's London hub of Heathrow to New York's JFK airport is loaded with over 7,000 items they tell us. Many of those have to be unloaded and re-loaded before each flight. Included in the inventory are 101 full bottles and 388 quarter bottles of wine, 293 headrest covers - which is a little odd as BA has three different configurations of 275, 299 and 345 seats, the average of which could be 306, so some folk won't be getting a headrest cover! Worry not, no matter what configuration there 747 has, there will be enough pretzels to go around as BA carry 350 bags of the salty snacks. 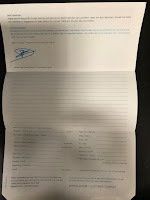 78 toilet rolls on the flight as well as five first aid kits and up to around 800 items of bedding, including the new Club World White Company bedding, which has been recently introduced. The airline says that 47 percent of us are travelling solo, while 27 percent travel as a pair. Around 70 percent are travelling for leisure purposes and 28 percent are flying for business and who knows what the other 2 percent are travelling for. 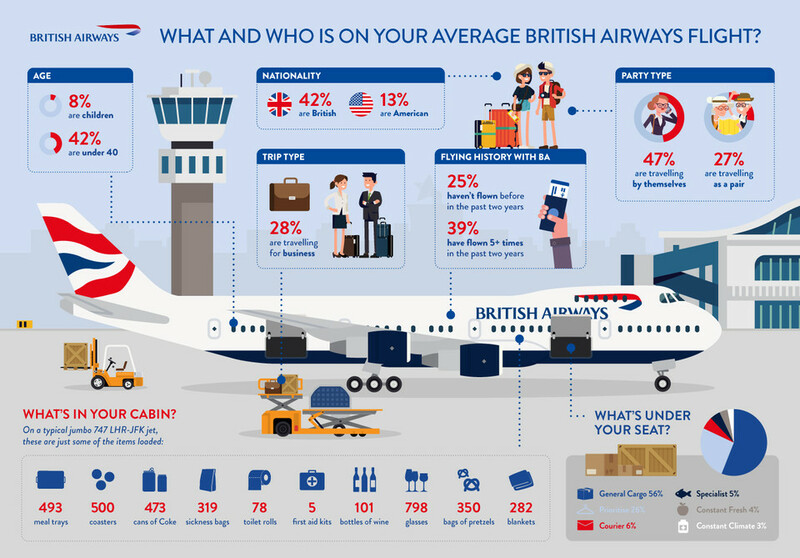 To help us visualise the figures, British Airways has created a patronising cartoon infographic of the results of its research, because we're all too stupid to know what a 747 or a control tower look like.